I�m 16 years old. Kids of my generation will face some major financial challenges in the years ahead, but Roth IRAs will help us overcome them. Roth IRAs are individual retirement accounts. There are two kinds of IRAs � Traditional and Roth. With the Traditional IRA, you invest �pre-tax� dollars in your IRA. When you do so, your taxable income is reduced by the amount of your contribution. In other words, you get a tax break when you invest in your Traditional IRA. However, those investments will grow and double many times � if you have invested early enough � and when you begin to withdraw the funds at retirement, all that growth will be taxable. Many persons assume that their income will be lower when they retire and that their tax brackets also will be lower, but that often is not the case � and I�ll explain below why it actually may go up (see Taxes, below). With the Roth IRA, monies invested are �after-tax� dollars. That means you already have paid taxes on the money you are investing. In other words, you have no current tax benefit from the investment. However, that money will grow and grow � doubling many times in your Roth IRA, and all that growth will be tax free. When you retire, regardless of the tax bracket you otherwise would have been in, your income from the Roth is tax free. Investing early in Roth IRAs is one effective way we can shield ourselves against some of the major financial challenges our generation will experience. Below I describe three of our future challenges, and explain why Roth IRAs will help us overcome them. The Challenge of Social Security: We do not know if Social Security will be there for us � 50 years in the future. If it survives, it may be �means tested� � in other words, higher net-worth and income retirees, who have greater financial means to take care of themselves, will receive lower Social Security benefits. So why work to become financially well off, and miss out on higher Social Security payments? Because Social Security payments are so low they will not provide us with quality of life, although those payments will sustain us in some marginal fashion. What most people don�t remember today is that when Social Security was started, it was meant to be an anti-poverty program � to serve persons in desperate financial need. It was not intended to be a �retirement� program. In all probability, Social Security will evolve back to its initial intent. Our Roth IRAs can give us the quality of life we hope to enjoy in retirement. The Challenge of Employer Contributions to Our Retirement Plans: We do not know if our future employers will contribute to our retirement plans � as they have done for our parents� and grandparents� generations. Many company contributions to employee 401(k)s � a company managed retirement plan for qualifying employees � were reduced or eliminated altogether during the recent recession. Although some plans are coming back, they are not as generous as before. In other words, in the past if a very generous employer would contribute $1.00 to a 401(k) plan for every $1.00 contributed by the employee �as a match�, today that match may be much lower � say $0.25 for every $1.00 contributed by the employee. Or the maximum amount the company will match has been reduced, say from $2000 to $500. Counting on employer generosity is problematic at best. With Roth IRAs started early in life, our own investments will grow and double many times and give us financial independence regardless of future employer contributions to our retirement plans. The Challenge of Higher Income Taxes: While Social Security benefits and employer contributions to our retirement plans will surely go down, our taxes will just as assuredly increase. That is because it will be our generation that primarily pays down the huge debt that is still growing today and will continue to grow into the foreseeable future. We can take no solace from the strident political debate about �no new taxes� -- because, even with no new taxes, our taxes will increase. That�s because of inflation. Our earnings may go up to help keep pace with inflation, but our buying power will NOT increase. However, because the amount we earn increases, that will push us into a higher tax bracket � a process known as �bracket creep� -- even though our buying power has remained static or even declined. Our taxes have gone up even though no tax increases were enacted. Inflation is inevitable, and may be part of our government policy to help us pay down our national debt with �inflated money�. Roth IRAs will help us in the future because all the growth in them is tax free, regardless of what happens with tax bracket creep or actual tax increases. And our future problems and challenges do not end there. We probably will have to pay more for our health care, more for our utilities (because our utility infrastructure is falling apart and will need to be replaced), more for our education, and on it goes. Roth IRAs will help us confront and overcome several of these major challenges. Investing early in our Roth IRAs will help us prepare for our future whether or not Social Security is there for us -- or regardless if our future employers contribute to our retirement plans. If Social Security is there for us and/or if our future employers contribute to our retirement plans, so much the better, but we should not count on either. And if taxes go up, which appears inevitable, all the growth in our Roth IRAs will be tax free. 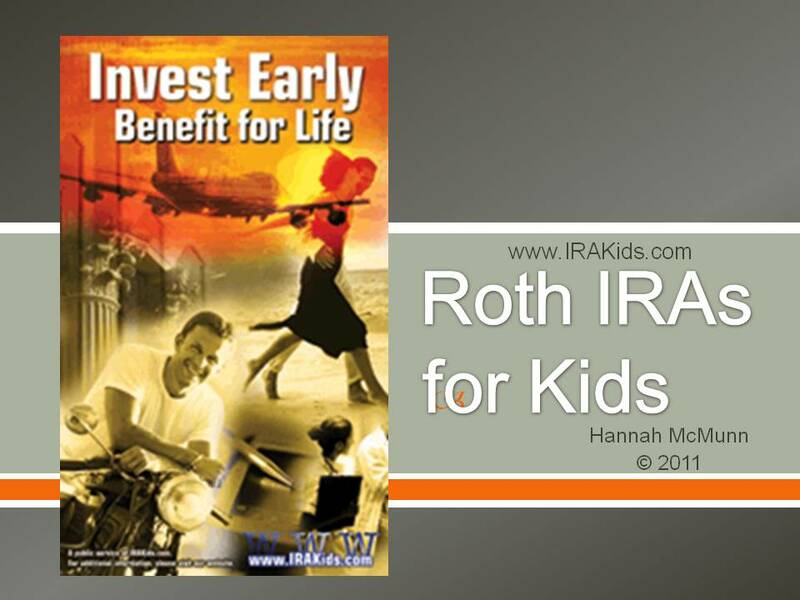 You can learn much more about Roth IRAs for kids from my website � www.IRAKids.com. My grandfather and I developed this website when I was 13 � as a way to help education other kids and their parents/guardians about the benefits of Roth IRAs. I also have prepared a PowerPoint presentation on Roth IRAs for Kids, which can be used by you, your parents or guardians, and grandparents to learn about Roth IRAs. The PowerPoint also can be used to make a presentation on Roth IRAs for kids at a boy or girl scouts meeting, at a PTO meeting, a church youth gathering, or on other occasions to share information on this important topic. The BizKids episode and the PowerPoint presentation are on the homepage of my website --- www.IRAKids.com. Now is the time for all of us kids to get a financial head start in life and the best way we can do it is through Roth IRAs. *Hannah was 16 when this article was written during the summer of 2011. � 2011, IRAKids.com. All rights reserved. Roth IRAs for Kids: Why Kids of My Generation Need Roth, by Hannah McMunn and C. Edward Wall, describes the two types of IRAs (Individual Retirement Accounts): Traditional IRAs and Roth IRAs. Hannah (age 16) emphasizes that Roth IRAs are an important shield against future financial adversaries, such as loss of or changes to Social Security , discontinuation or reductions to employer matches to retirement plans, and increased taxes � if only through �bracket creep�. With Roth IRAs, an individual has a financial head start toward financial security regardless of what happens to Social Security and employer matches to retirement plans, and it doesn�t matter if taxes go up because income from our Roth IRAs is tax free. 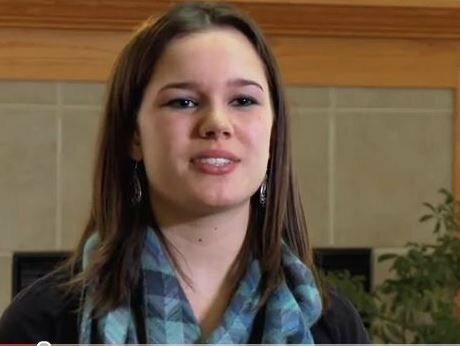 This article is made available for educational and republication courtesy of IRAKids.com. This article may be reused freely for educational purposes and may even be reprinted in other print financial publications (e.g., credit union newsletters) to encourage kids to start Roth IRAs as soon as the kids have earned income. The article may not be sold or included in a publication that is to be sold. The article may not be loaded on other websites, but the abstract may be used and/or the article may be summarized on other websites. In all cases, the authors and the IRAKids.com website must be credited with authorship, and links should be provided back to the IRAKids.com website -- for additional information on this subject. For other uses of this article, please contact IRAKids.com. For additional articles on Roth IRAs for Kids, which may be reused according to the �Guidelines� noted above, please see Articles by Hannah on Roth IRAs -- for Free Reuse Elsewhere.